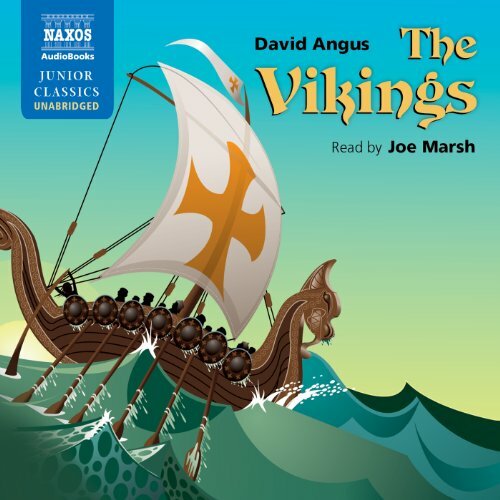 The Vikings are as intriguing as one would anticipate, and Naxos makes this audiobook a thrilling educational experience. Here dragons of old are REAL - they are the fiercely decorated Viking ships. Narrator Joe Marsh brings his humor, enthusiasm, and excellent pronunciation to this novel. The "wild" men have names, and their bravery is heralded. Their rich history is covered, and their myths and legends are fully explored, making them even more beguiling. Best of all, Marsh sounds like he's talking solely to the listener. What a great way to learn! This entertaining and informative account was written especially for Naxos AudioBooks by David Angus, author of Great Explorers of the World, Great Inventors, and other spoken-word histories. A nonfiction book that's jam-packed with facts, yet has all the narrative force of fiction. It held my children (8 & 9) spellbound. Would you consider the audio edition of The Vikings to be better than the print version?